A few days ago I posted a blog about a new EnScript I wrote based on a reader's suggestion here. 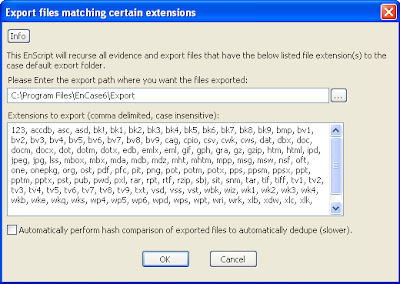 If you check this box, the EnScript will hash every file it exports and if any additional files match the hash values of previous files, the contents will not be exported. Instead, the duplicate file will be created, but the contents will contain the text "DUPLICATE" as well as the path of the ORIGINAL file with the same hash. The log file "index.csv" will also indicate each file that is a duplicate and list the hash values for all the files.